The Bach 6 model I consider to be a specialty horn. With a .485 bore and 7 inch bell, not only is it a small trombone but a very light blowing one as well. I’ve never played a standard trombone with as light a feel as the 6. Great for specialized high range playing and lead work, I’ve also heard of it being used on occasion for certain French solo literature. The modern Bach 6 plays quite differently than the vintage models of the 30s and 40s. I have a New York model 6 iv that was made at the Bronx factory in 1942. Even though it has the same bore and bell sizes, it is a gutsy and much bigger blowing horn than the modern Bach 6. It was obviously intended to be more of an all purpose trombone in those days and really plays surprisingly bigger than you would expect for its size. They both are quite enjoyable to play in the right context and situation. This instrument review was with a Monette TS 11 mouthpiece. 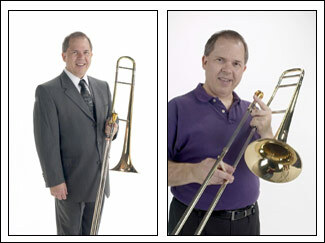 The Bach 8 model is a smaller .490 bore trombone similar in size to the King 2B. As with Bach in general, it is a heavier horn than the 2B. I tend to over blow the 2B a bit, so the 8 is more to my taste. If you want something with the feel of a 2B, it is probably not for you. Even so, the 8 is very flexible and responsive with a great, bright sound. I like it with the gold brass bell which mellows it out just a bit without loosing too much of its bite. 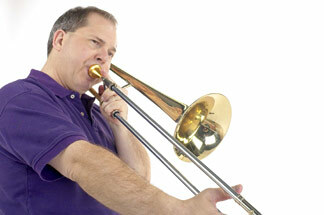 It makes a fine lead or jazz horn, and is good for commercial work where a smaller trombone is desired. 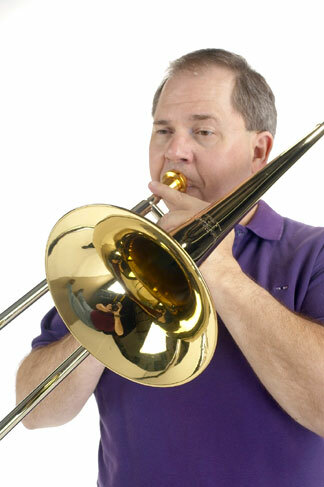 It is a terrific trombone to play if you can find one. Unfortunately, both the Bach 8 and 6 models are no longer in production at this time. "Stradivarius" - .485" medium bore, 7" one-piece yellow brass bell, lightweight nickel silver outer handslide tubes, chrome-plated nickel silver seamless inner slide, nickel silver handgrip, tubular nickel silver body braces, removable gold-plated balance weight, clear lacquer finish. Comes with genuine Vincent Bach small shank mouthpiece and zippered Cordura covered wood shell case. "Stradivarius" - .490" medium bore, 7-1/2" one-piece gold brass bell, lightweight nickel silver outer handslide tubes, chrome-plated nickel silver seamless inner slide, nickel silver handgrip, tubular nickel silver body braces, removable gold-plated balance weight, clear lacquer finish. Comes with genuine Vincent Bach small shank mouthpiece and zippered Cordura covered wood shell case.